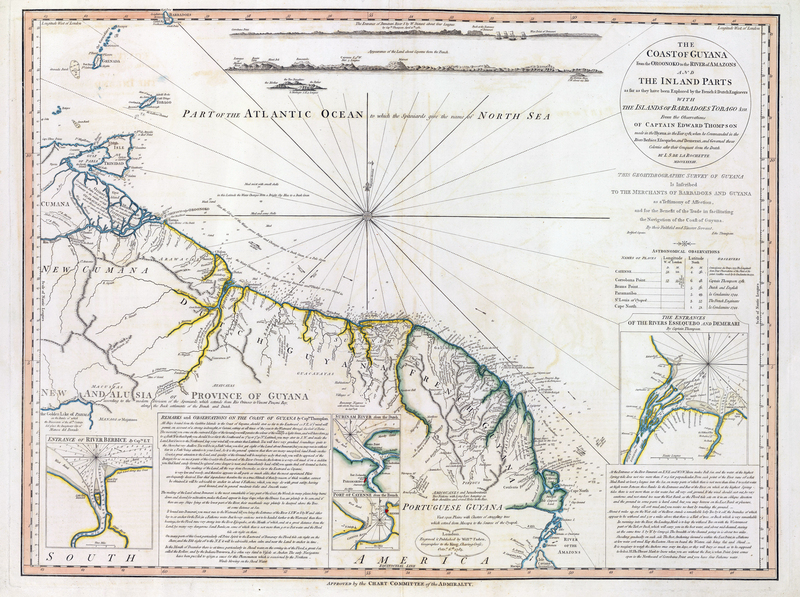 Demerara and Essequibo were two river colonies along the Northern coast of South America. Essequibo was established at the beginning of the Seventeenth Century and was not far from another Dutch river colony at Berbice and another on the River Pomeroon. Rivers were very much a requirement for the seafaring European mariner empires. They were required for exploration, transportation and to provide a realistic means of communication. 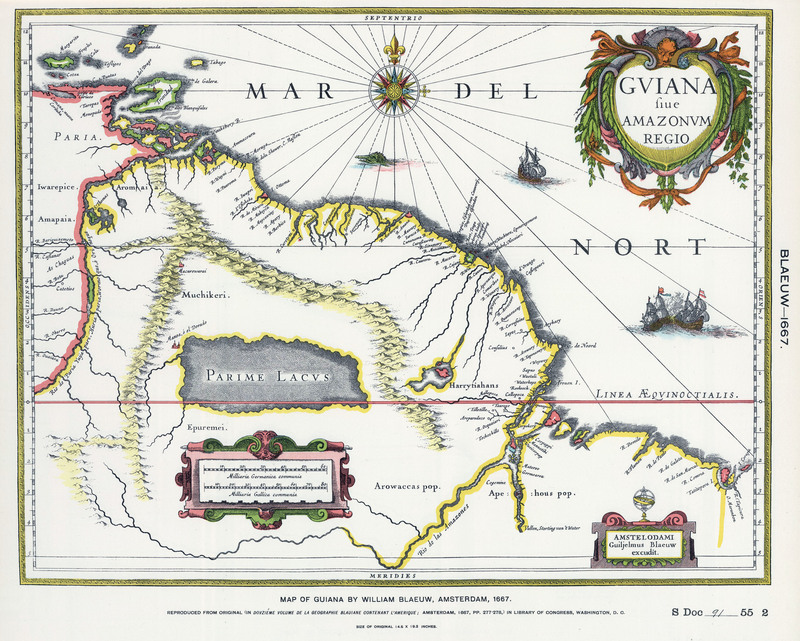 Stories of an El Dorado on the Spanish Main had provided a further impetus to European interest in the region. In reality though it was to be the lure of plantations and in particular sugar, which was very much pioneered by Dutch planters, that turned this unlikely stretch of coastal jungle into profitable settlements. England's first interest in the settlements came during the Second Anglo-Dutch wars in 1665. Lord Willoughby wished to secure the English colony established since 1650 at Surinam and tasked Major John Scott to make a pre-emptive strike using forces from Barbados. 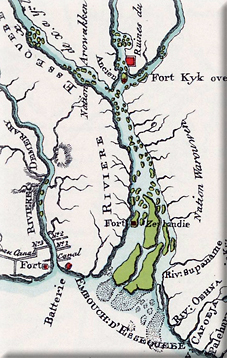 Scott formed an alliance with local Caribs and proceeded to take the colony of Pomeroon by capturing the fort at New Zeelandia and then proceeding to capture Essequibo by heading up its river to attack the Dutch fort at Kyk-over-al. 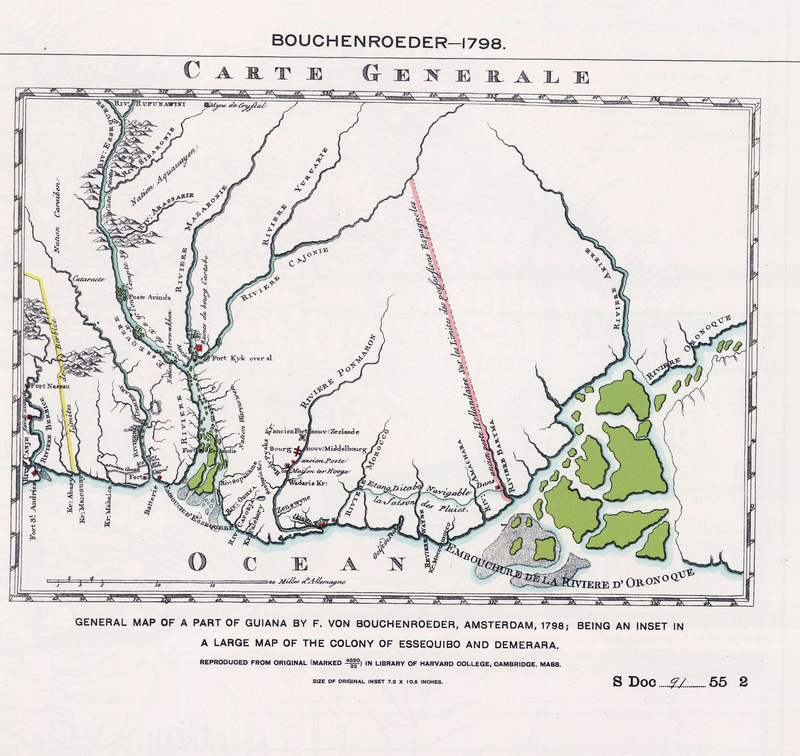 Disaster was to befall this small expedition as a Dutch relief force from Berbice marched overland to seize back Kyk-over-al. A French force arrived off Pomeroon also with their own local forces, the Arawak. After a short siege at the fort in Nova Zeelandia, the English surrendered only to be massacred by the Arawak tribesmen. As a result of this war, England traded her Surinam concerns to the Dutch in full in return for Dutch lands in North America in what would be renamed New York. Over the next century and a half, it was not to be the English or after 1707, the British, who caused problems for the Dutch colonies, but the French, Spanish and innumerable pirates and privateers who sought to raid the isolated colonies. After 1688 relations between the Protestant Dutch and Protestant English improved significantly and in an era before passports or effective bureaucracy settlers could move fairly freely between colonies. In the Eighteenth Century, as the amount of available plantation land on the small British islands of the Caribbean diminished, many British would-be planters turned to Dutch colonies like these. This freedom of movement was further facilitated in 1740 by an enlightened Dutch Governor by the name of Storm van's Gravesande who declared the colony open to settlers of all nations. Furthermore, they were granted free land with 10 year's freedom from taxes. The influx of settlers, the majority of whom were British, increased considerably. 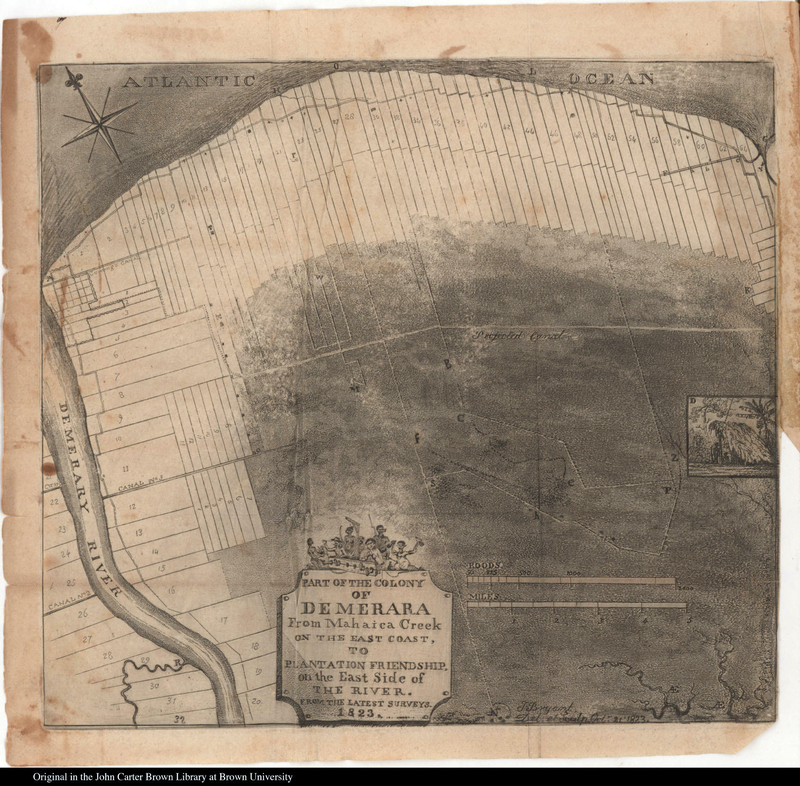 So much so, that an application was made to formally create the new colony of Demerara along the nearby Demerara river system. 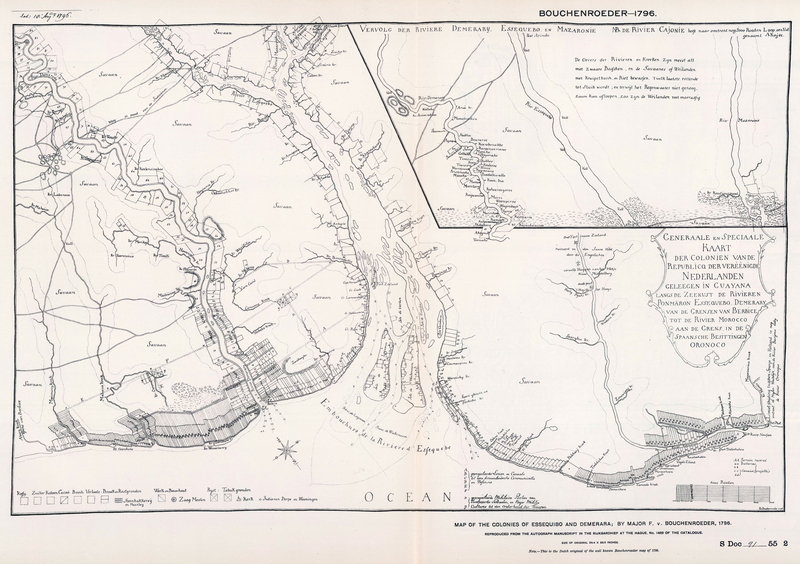 The settlement of Stabroek would later form the main administrative centre of that colony. In Essequibo, the administrative centre moved from Kyk-over-al to Fort Island at the mouth of the River Essequibo. Most British settlers came from the relatively crowded colony of Barbados whose land was already mostly accounted for. There numbers were so significant that in 1750 a commander of the British population was assigned, giving them a form of representation within the Dutch colonies. In fact, by 1763 British setters formed the majority of the population of Demerara and owned roughly one-third of the plantations there. They also brought knowledge and experience from their own colonies and were the first to introduce water-driven mills to the sugar plantations. Formal British interest in controlling the colony came as a by-product of the American Revolutionary Wars. Holland had thrown in their lot with with Spain and France. The British always gave priority to the rich sugar islands of the Caribbean even over the agrarian 13 colonies to the North. 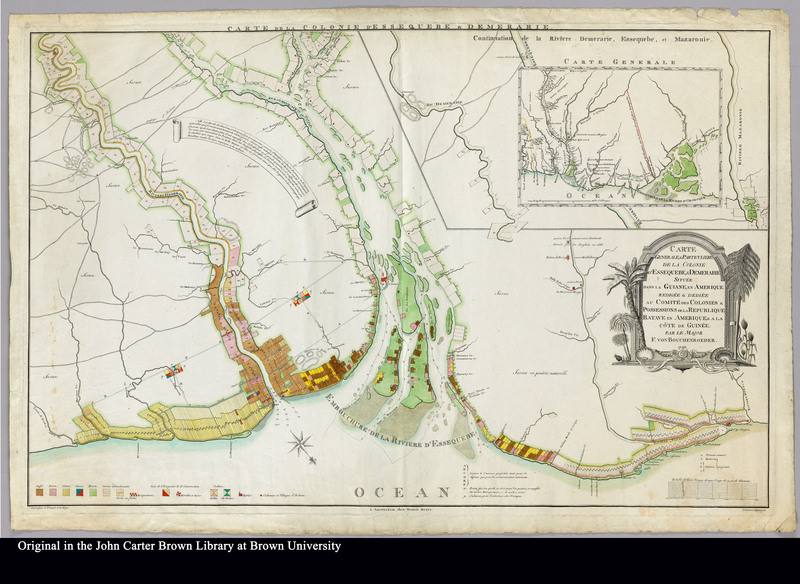 Consequently, they launched a major attack to seize all three of the River Colonies in 1781. British control was not to last long though as the French launched their own expedition to seize the colonies on behalf of their Dutch allies the following year. This enforced change of ownership had internal ramifications even when the French returned them to the Dutch in 1783. The Dutch West Indian Company wanted to reform the finances of the colonies only for the settlers to refuse to surrender their rights. Taxes were not paid and the colony was ultimately taken over by the Dutch State government in 1791. The French Revolutionary Wars spilled over into the Netherlands. At first, the Dutch were allies with the British but when the French army advanced into the Low Countries she set up a sympathetic Batavian Republic which was then effectively forced to go to war with the British. Consequently, all French and Dutch Caribbean colonies became a target for the Royal Navy. The British sent a major naval squadron to the Caribbean in 1796 and seized all three of the River Colonies. Not only had the British denied valuable products to her enemies, but she could sell the products for herself. The British occupied the colony for the next six years. At the Peace of Amiens in 1802, the colonies were returned to the Batavian Republic. But when the fragile peace collapsed the British reoccupied the colonies the following year. British victory at the Battle of Trafalgar gave her unparalleled control of the seas. Any French or Batavian ability to retake the colony disappeared for good. The colonies became subject to the British ban on the Slave Trade from 1807 onwards. This had the result of pushing up the price of labour although it did not do much to improve the status and rights of the slaves as the anti-slavetrade campaigners had hoped. The cost of labour meant that the colonies increasingly turned to the more profitable sugar and coffee and cotton production fell by the wayside. In 1812 Stabroek was renamed by the British as Georgetown. It would become the administrative centre for the British. In 1814, after the first fall of Napoleon, Britain agreed to return most of the colonies that they had seized from the Dutch with the exceptions of her South American colonies of Berbice, Demerara and Essequibo. 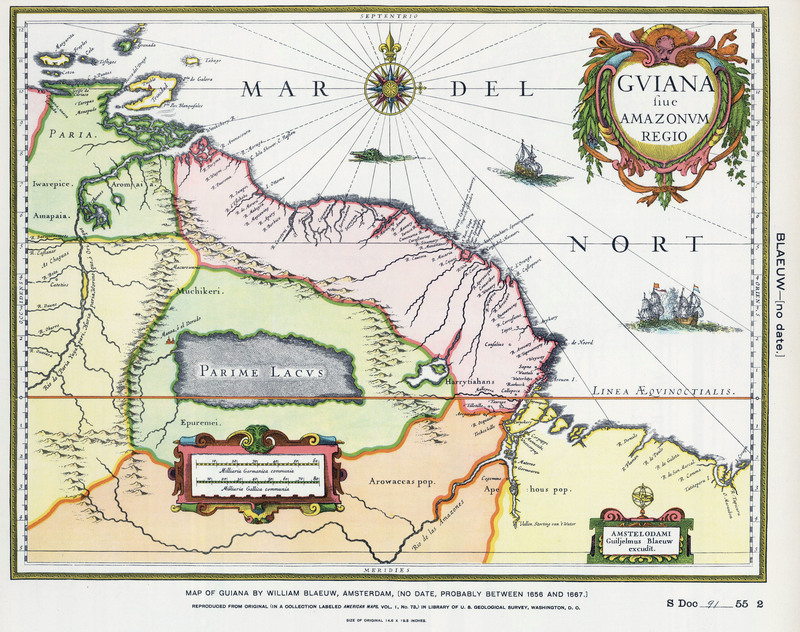 Furthermore for administrative convenience the British combined the two colonies of Demerara and Essequibo although Berbice was treated as a separate colony for another 17 years. The shift to becoming a British colony was not a significant one for the Dutch planters. They had become accustomed to trading with the far wealthier British Empire than with a Dutch Empire very much on the wane. Britain also had many more local colonies to trade with and was also a sponsor to the opening up of trade on the South American continent by backing various nationalist and revolutionary movements. Consequently, there was no clamour from the Dutch planters to return to Dutch rule at the end of the Napoleonic wars. They were quite content with the new status quo and of course had been used to British administration for nearly two decades by the time of formal absorption into the British Empire. The Waterloo hiatus temporarily delayed Dutch ratification of this agreement, but on 20th November, 1815 the Dutch formally signed over all legal claims on the lands to the British. One of the most serious slave revolts in the British Empire broke out in Demerara in 1823. Slaves had believed that reforms back in Westminster would result in their immediate emancipation. Disappointment at not receiving freedom combined with continued harsh treatment resulted in an uprising of over 13,000 slaves across the colony. The authorities and some plantation owners were tipped off on the timing of the revolt and prepared themselves in anticipation of trouble. Unlike other uprisings, there was a distinct lack of bloodshed from the slaves. Many Europeans were restrained or locked up but few were killed and mutilated as in other Caribbean island revolts. Nevertheless, the authorities replied in a harsh manner. Martial law was declared and troops despatched to suppress the rebellion. Within a week, the British had regained control and authority. Using the courts martial procedures, ringleaders were executed and their heads cut off and nailed to posts as a warning to others. An English pastor, John Smith, accused of giving aid and comfort was found guilty but died in custody. News of the harsh actions of the British authorities horrified many back in Britain and resulted in a huge infusion in support for abolitionists. Initial sympathy for the plight of isolated Britons evaporated with tales of mutilation and death meted out by the authorities. The Demerara Uprising cast a questioning shadow over the morality of slavery. Demerara and Essequibo along with Berbice were formally united into a single colony of British Guiana in 1831.